Every baseball fan is now very well aware of Madison Bumgarner, who he is and what he does for the game. The 6’5 250 lb. southpaw out of Hudson, NC has worked himself into national attention and earned status of a household name, particularly after his 2014 WS performance which will go down as one of, if not the best, championship performance of all-time. He has progressively gotten better each year of his career thus far, as seen by an ERA that is staying below 3 since 2012, a decreasing WHIP and increasing SO/9 ratio (Strikeouts per 9 innings pitched). He is having a career year so far in 2016, with a career low in ERA (2.12) and WHIP (.98) with a career high in SO/9(10.3). So for how long can we keep expecting MadBum to improve and improve before his performance flattens out? I’ll argue for a while longer. I’ve previously noted that Madison Bumgarner seems to get better later in the year, just by eyeing his performances and looking at results year by year. I decided to take a more quantitative approach to my theory that MadBum is a top tier performer in the dog days of summer. And undoubtedly the stats backed me up, and numbers never lie right? So in total, he owns a 31-19 record in post-July ball for a 62% winning percentage. He has tossed 7 complete games and 4 shutouts in 65 games started, striking out 432 and walking just 96 in 428.1 innings pitched. Those numbers equate to a 2.67 ERA, 1.086 WHIP and a 9.082 SO/9 and 4.5K/BB ratio. In his starts in August, September, October (regular season) his winning percentage is higher than his career average of 60.1% and he sports a lower ERA and WHIP than his career averages of 2.94 and 1.097. He has tossed over half (7/13) of his career complete games and two thirds (4/6) of his career shutouts in these hot summer months. His SO/9 and K/BB ratios are also higher for these months than his career averages of 8.9 and 4.27 respectively. Many could argue a lot of these increases seem marginal, but they are hardly so. A decrease of almost .3 in ERA and a full .01 decrease in WHIP are both significant decreases for an MLB pitcher. But the most impressive increase is his proclivity for throwing complete games, and shutouts, in these hotter months. Particularly in the month of August, Bumgarner has 6 of his 13 total complete games and 3 of his 6 total shutouts. The warmer weather may help a bit, as hotter game-day temperatures may allow his arm to be looser and therefor toss more pitches per start. But that doesn’t alone explain how he has half of his career CG’s and SHO’s in just one calendar month. 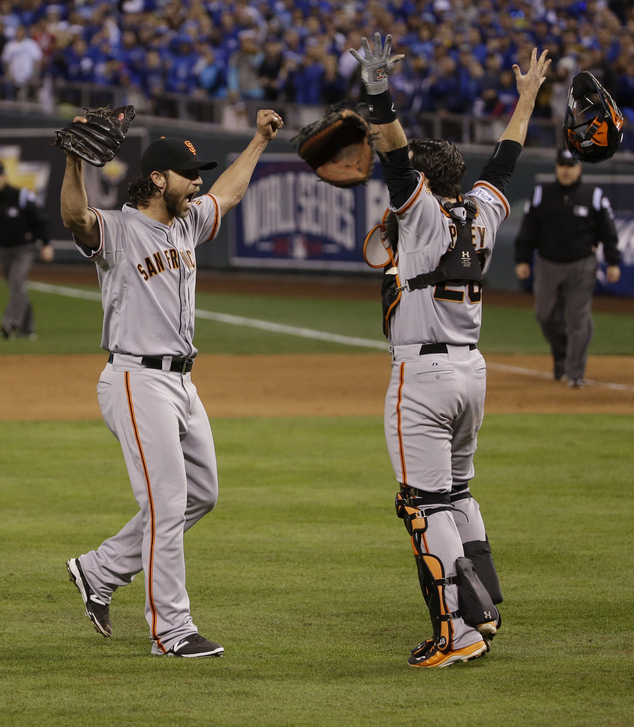 Bumgarner’s clutch gene may just be stronger than your normal MLB starter. August and September are pennant race months, and the NL West in particular seems to be tight each year between the LA Dodgers and MadBum’s San Francisco Giants. performance, let’s look at his career as a whole. Bumgarner holds batters to a lowly .182 BAA when there are 2 outs and runners in scoring position. In late and close games, defined below, Bumgarner allows just a .239 BAA and allowed just 35 runs to cross the plate in 330 plate appearances (about 1/10th of the time). That is remarkable to me, as that means Bumgarner only gives up a run in close games to 1 in every 10 batters; That’s better than giving up 1 run in just over every 3 innings pitched of close games. Bumgarner holds leads remarkably, and keeps his team in close games long enough to give his offense a chance to take a lead back. Madison Bumgarner might be obviously getting better year by year, but I don’t think he’s done getting better even in the midst of a career year. If his past performance is any indicator, he might just be lights out in August once again. I don’t think the August, September and October numbers are flukes in the slightest. His performance in the late-season games passes the eye test and now the quantitative test, and to me, that is all the proof needed. MadBum is a workhorse pitcher who does not tire or wear down as the season progresses. Of course, numbers can be deceiving after all, so only time will tell if Bumgarner can continue his impressive summer performance. And it is an even year, Giants fans, so this 2016 season has a pretty good outlook. Late and Close Games are defined as plate appearances in the 7th inning or later with the batting team tied, ahead by one or the tying run is at least on deck.